I was watching Dumbo recently with a smile because the climax of the movie is actually a universal plot essential; basically Dumbo has already learned to fly with the mental help of this tiny feather he's holding in his trunk...and the psychological encouragement from the crows and Timothy the Mouse. But in the last scene of the movie he jumps from the burning building (as part of the circus act) and LOSES THE FEATHER. So he must fly without any mental help. The Character must Grow. It's a great scene because it's exactly the pivotal moment in all good movies. I think of George McFly punching Biff in Back to The Future I, or Baby doing the lift with Johnny at the end of Dirty Dancing...Or Darth Vader refusing to kill Luke in Return of the Jedi. I will call it the "Dumbo Moment". I may have already had my Dumbo Moment pass me by but I was mired in self-examination at the time. Interestingly, a movie like Top Gun has a scene that the filmmakers would like to describe as a Dumbo Moment but is really nothing more than artificial tension. When Maverick panics during the ultimate gunfight and wanders away from the dogfight he eventually turns around. Why? How? The character change is totally manufactured. The real climax is when Mav refuses to leave his position as wingman...thus signifying his change into a team player. However, this also is manufactured and hollow because he's only doing his job finally. BIG DEAL. Furthermore, Mav's immediate action after this enemy encounter is to elect to be an instructor back at Top Gun academy...signifying another hollow and unbelievable change and he's abandoning active duty to teach pilots those hard lessons he learned on the beach volleyball court! The image above is something that troubled me because those look like power lines...because they have ceramic insulators at the top and they are separated. This image is from 1941 so I'm not sure what the animation artists were thinking. Those wires look like standard 3 phase power transmission wires and Dumbo is doing exactly what would cause him to be fried. We discussed this phenomena in the electrical field even though we were not power company electricians. A bird can land on a power line because he is not crossing phases. He can only touch one line at a time and he is not grounded so he won't get electrocuted. 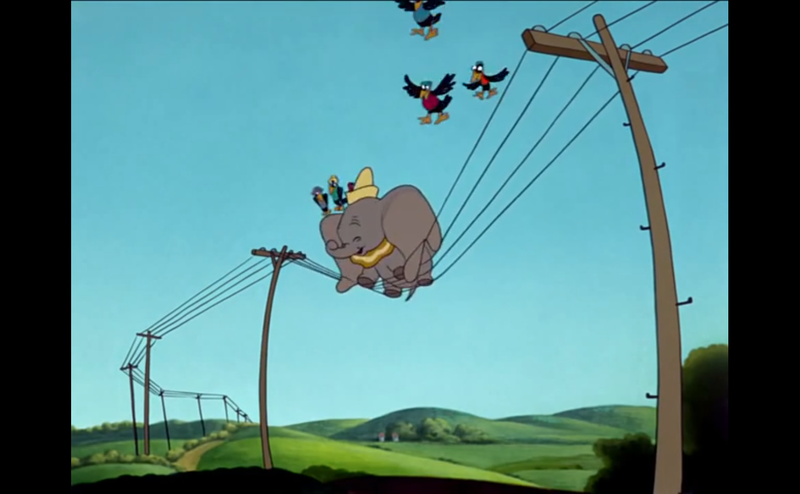 But a bird can not touch two lines at the same time, as Dumbo is doing here, or else he'd be toasted elephant. Telephone lines don't have to be separated...and they don't need ceramic insulators. But maybe in 1941 this is what telephone/telegraph wires looked like. I don't know. I want to caution all the elephants reading that when you learn to fly DO NOT land on power lines. You can land on telephone lines but they are very similar in appearance to power lines so just to be safe don't land on any lines. Ok?